Bilbao, the capital of Bizkaia, was known for its steel. So well known that a type of sword popular in England and America was called a bilbo, after the Basque city. (In Basque, the name of Bilbao is Bilbo…) In Basque, they were called Labana Bizkaitarrak. These swords were made in Bilbao and exported widely. This sword was popular because it was typically well forged and very flexible. Bilboes also refers to a type of shackles, put around the ankles to immobilize people. While it isn’t so obvious that the name of these shackles also comes from the Basque city, the fact that they were made of steel suggests it is possible. Joseba Zulaika, in his book That Old Bilbao Moon, suggests the same origin for the name. However, these devices were in use before Bilbao started exporting steel to England. In any case, these bilboes have a dark history, used to confine prisoners and slaves. The most famous Bilbo, these days, is Bilbo Baggins, of The Hobbit fame. While it isn’t clear where J. R. R. Tolkien got the name for his character, at one point Bilbo finds a sword, called Sting, that plays an immensely important role in the story of Mr. Baggins. It is possible that Tolkien named his character after the sword or, maybe more probable, was inspired by the name he had chosen for his character to outfit him with a sword. The photo of bilbo, the sword, not Bilbo, the hobbit, linked to above is from this site. 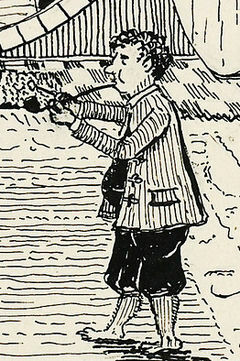 The image of Bilbo Baggins was taken from Wikipedia, but drawn by Tolkien.